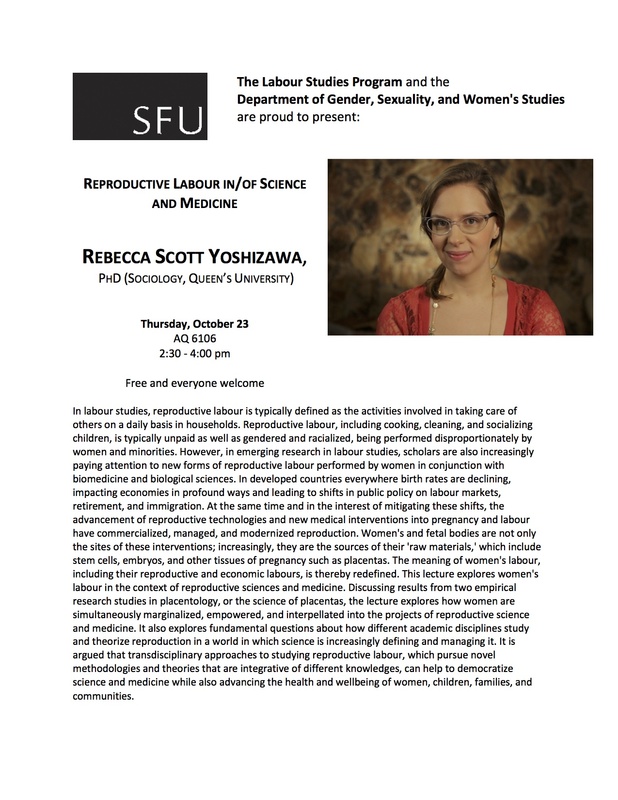 On October 23 (note: start time was changed; 2:30pm-4pm AQ 6106 Burnaby Campus), I will be giving a lecture for the Labour Studies Program and the Department of Gender, Sexuality, and Women’s Studies at Simon Fraser University. I feel very privileged to be invited to give this talk at my alma mater. Here is the title and abstract! All are welcome! In labour studies, reproductive labour is typically defined as the activities involved in taking care of others on a daily basis in households. Reproductive labour, including cooking, cleaning, and socializing children, is typically unpaid as well as gendered and racialized, being performed disproportionately by women and minorities. However, in emerging research in labour studies, scholars are also increasingly paying attention to new forms of reproductive labour performed by women in conjunction with biomedicine and biological sciences. In developed countries everywhere birth rates are declining, impacting economies in profound ways and leading to shifts in public policy on labour markets, retirement, and immigration. At the same time and in the interest of mitigating these shifts, the advancement of reproductive technologies and new medical interventions into pregnancy and labour have commercialized, managed, and modernized reproduction. Women’s and fetal bodies are not only the sites of these interventions; increasingly, they are the sources of their ‘raw materials,’ which include stem cells, embryos, and other tissues of pregnancy such as placentas. The meaning of women’s labour, including their reproductive and economic labours, is thereby redefined. This lecture explores women’s labour in the context of reproductive sciences and medicine. Discussing results from two empirical research studies in placentology, or the science of placentas, the lecture explores how women are simultaneously marginalized, empowered, and interpellated into the projects of reproductive science and medicine. It also explores fundamental questions about how different academic disciplines study and theorize reproduction in a world in which science is increasingly defining and managing it. It is argued that transdisciplinary approaches to studying reproductive labour, which pursue novel methodologies and theories that are integrative of different knowledges, can help to democratize science and medicine while also advancing the health and wellbeing of women, children, families, and communities. According to biological sciences, placentas are transient organs that are necessary for mammalian fetal development and produced by interaction of maternal and fetal cells, a process called “placentation.” The aim of this dissertation is to understand as well as elucidate effects of placentations. I employ an agential realist framework to do this analysis. As developed by Karen Barad, agential realism is a performative theory of the irreducible entanglement of matter and discourse that relates knowing and being as inseparable. Intra-action is the foundational operationalization of agential realism. Unlike interaction, which assumes that agential entities pre-exist their meeting, intra-action refers to the entanglement of mutually constituted agencies. Informed by this ‘onto-epistemology,’ I define placentation as the differential and entangled intra- and inter-species, intra- and inter-cultural, and intra- and inter-disciplinary production of placentas. This definition is ‘naturalcultural,’ presuming that nature and culture are not distinct realms occupied by distinct kinds of beings. Rather, such a duality is a performative effect of what Barad calls agential cuts enacted by the specific apparatuses that are employed to understand it. To understand placentation naturalculturally requires the breaching of disciplinary boundaries that relegate ‘culture’ as a topic proper to the social sciences and ‘nature’ to science. This dissertation breaches these boundaries, and in so doing opens up new avenues for thinking about placentations and their consequences. In order to empirically explore placentations, I interviewed and/or observed 31 scientists who study placentas, and reviewed scientific and other secondary sources. The main findings of this dissertation concern differences made by theorizing placentas in particular ways. Based on these findings, I argue that understanding placentations naturalculturally is not only a more accurate approach than the one predicating dominant scientific explanations, but also prompts new ethical, theoretical, and practical considerations concerning pregnancy, bioethics, environmentalism, health, and more. Como socióloga eu estudo ciência e, especificamente, estudo ciência da placenta. Pode ser surpreendente descobrir que, do ponto de vista da ciência, a placenta tem várias utilidades. É claro que a placenta é estudada extensivamente em biologia reprodutiva, por que é fundamental para a gravidez e pode ser determinante para os resultados da gravidez. Mas também é necessário estudar a placenta a partir do referencial de outros campos além da biologia reprodutiva, porque se trata de um tecido grande, amplamente disponível, muitas vezes considerado “lixo,” e que tem diversas propriedades interessantes. 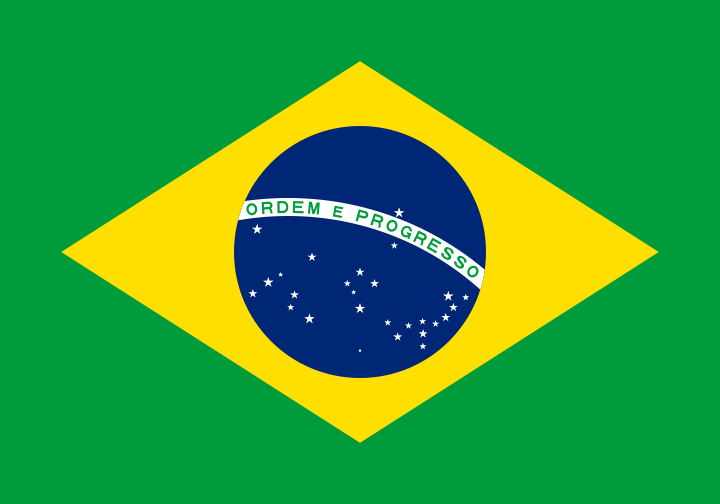 Tem uma grande variedade de aplicações científicas em muitos campos como imunologia, pesquisa do câncer, toxicologia e engenharia de tecidos. Por isso, placentas são regularmente coletadas em hospitais de todo o mundo e utilizadas em experiências científicas. Todas as minhas pesquisas se concentram nas práticas de doação, coleta e utilização da placenta para fins científicos.